As with our lives, we are supposed to pursue improving our homes relentlessly. It can feel like a personal struggle: hunting down creative home-improvement ideas, choosing which project to undergo, then investing the time, work, and materials needed to implement these upgrades in our homes. The reason it feels personal is that it is personal; our homes are where we spend most of our time. They are our safe spaces, private places, and refuges after long days or weeks of tiresome work. What could be more personal? 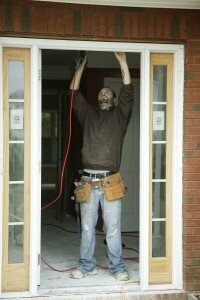 When something as emotional–even for men–as home improvement is in order, there are a number of choices before you; namely, should you do it yourself, as all the trendy blogs and picturesque websites instruct, or should you put aside your pride and whimsy and hire a professional contractor? While there is certainly no shortage of home-improvement ideas or galvanizing DIY sermons, there is a real shortage of clear-cut, objective pro-con lists weighing DIY against professional labor. I’ll offer you the latter right here. Pro: Everybody loves the pride accomplishment brings, and a successful DIY job gives you plenty. Con: Everybody has self-preservation, but certain DIY jobs involving large power tools, heat exchange, and electrical systems can actually kill you. Pro: Doing home improvement yourself is a great savings. Con: Doing home improvement yourself is extremely time-consuming; expect to give up at least 2 full days or even several weeks for your project, depending on how ambitious it is. Pro: You do not have to worry about paying slow, lazy, hired help by the hour or fearing that workers will do shoddy and simplified work–the “If you want it done right, do it yourself” mentality. Con: These workers can recognize mistakes or find unexpected problems and repair them (hidden mold, termite damage, bad plumbing or electrical work, etc. ), whereas you probably cannot. Pop quiz: What are the signs that electrical work is not up-to-code? Pro: A good contractor will hold themselves to a standard of excellence. They will not leave a work site until the job is done correctly, sealed-up, and cleaned-up. Con: You will have to deal with strangers working in your home for several days. You might want to wear pajamas in the morning. Pro: You need not have even a smidgen of related knowledge for a home-improvement project to be done right. Contract laborers know what they are doing and know what that thingy is that sticks out of pipe joints under your sink. Con: Contract labor is paid labor, so you are paying for much more than the tools and materials required for a project. It seems that some small projects within your wheelhouse can certainly be DIY. Painting is no-big-deal, nor are hanging floating shelves or replacing your appliances. You can even learn how to replace light fixtures or refinish a hardwood floor by following instructions on Lifehacker and other DIY-leaning resources. However, any undertaking that calls for serious changes to the structure of your home, fooling with a system that runs throughout the house (ventilation, plumbing, electricity), or doing dangerous work should be left to a professional. As stated above, professionals know what they are doing. You might have half of an idea what you are doing, but that other half can be what ruins you, if not your home. The first one is not personal but common and widely feared: asbestos. Do you know what this literally-sickening substance looks like? If you purchase an older home, do you know all of the signs that it is present in your walls or ceiling? Most people who have been hospitalized due to asbestos exposure have encountered this mineral during a DIY project and continued to work around it in blissful ignorance. This one gets personal. My father’s family is full of people involved in construction-adjacent fields–real estate, flooring sales, stone hardware production–who also happen to assume that because they see home improvement happening around them, they can do their own home improvement. My uncle, a carpet store owner, once decided to lay tile in his kitchen DIY-style. Because of the angle at which the countertops ran, he decided to start laying the flooring at opposite corners and meet in the middle. After 2 full afternoons of work, not only did he discover that the 2 groups of tile did not align when they met, but he found that because he had mixed the grout in small batches using different amounts of water, the result was a patchwork of grout in different colors, girths, and consistencies! I’ll humor you with one more. My father, a salesman for a house developer before the 2008 housing crash, assumed that he knew how to run electric wiring from inside the dining room wall to an exterior patio, which had recently been crowned with a pergola roof. While running cable into a new outlet with the circuit flipped off, my dad decided to loosen the wiring by holding the metal edges of the outlet with one hand and using metal pliers with the other. The results, needless to say, were shocking. (And I only joke about it because he is just-fine, luckily.) I did not know why this happened–nor did he–until an electrician friend explained to my father that even though the right circuit was flipped off, he had completed a circuit through his own body by touching metal pieces to an electric wire with both hands. To sum it all up, the possibilities for DIY work are endless, but so, consequently, are the potential horror stories. Things are unlikely to get nasty if you decide to repaint your own cabinetry, but when DIY meets tough jobs, either you or your house is likely to get bruised. I completely agree with you. There are some projects that are small enough and easy enough to do on your own, but for larger projects that require more skill, a professional should definitely be the one to do the job. I am getting ready to sell my house and I need to have my driveway repaved. That is certainly a job I will hire a contractor for. Thanks for sharing the helpful information! Great post, Erin! I’m very glad that I stumbled upon your post because I’ve been thinking about hiring a paving contractor. I think you’re absolutely right: when hiring a contractor, it’s important that you’re hiring a professional. I’ll be sure to follow your suggestion by looking for their license. Thanks for sharing this information with us; it’s been very enlightening! I like how you said, “A good contractor will hold themselves to a standard of excellence.” I like that about hiring commercial contractors. We are planning on making some changes to our home that are too complicated for me to do on my own. It’ll be nice to have a pro to help us. Thanks for the info! It is really interesting to get this comparison of when jobs can be done DIY style, and when it is necessary to call a professional. I agree with what you said that little jobs can often be done on your own, but bigger projects are much safer when a professional is called. I imagine that electrical and plumbing issues are better off done by a professional since they are such a big part of the home. Thanks for sharing this! The first pro for hiring a contractor was great. I mean can you find a better pro then the fact that contractors are professionals. I’ve seen too many of my friends do DIY projects and have horror stories like the ones you mentioned. I think I”m going to pass on trying the DIY route and go with a contractor, thanks! Cool post! I learned a lot about when it is best to hire a contractor by reading this. Thank you for explaining how “A good contractor will hold themselves to a standard of excellence. They will not leave a work site until the job is done correctly, sealed-up, and cleaned-up.” I have done a lot of remodeling in the past and the contractor that I hired always did a really good job and proved why he was a professional. It’s comforting to know that there are contractors that can help people with their electrical needs. I learned last year that if you don’t know what your doing when it comes to working with electrical wires, it’s wise to call in a pro. I’m grateful for these services and all that they do to help people have better lives. I love DIY projects especially the ones that help fix up my home. Although, I agree that sometimes it is best to leave it up to the professionals. I think as long as you know what you’re confident in your skills and have the proper supplies then you’ll be ok for simple DIY projects. this is a great way to know when you need to hire a contractor. For me, I’m terrible with tools or just being handy in general around the house. I’m the ideal client for a contractor since I really would not be able to do anything without them. Thanks for the awesome advice! Thank you for stating the pros and cons to both DIY work and Contract work. I think a contract worker is some of the best work because you have a trained professional working with you. You don’t have to worry about getting the work done and it probably is a lot quicker. You make a great point that DIY work is limitless, but that doesn’t mean it will be great quality. I can do quite a bit on my own, but even for me there is a line where I will hire a professional. It only takes one project going wrong for you find that point for yourself! for a weblog website? The account aided me a accepgable deal. I agree– there is no better feeling than being proud of something you did yourself. However, there are some DIY projects that could put you at risk. Electrical wiring, for example, is something I would never mess with. I wouldn’t want to accidently hurt myself!